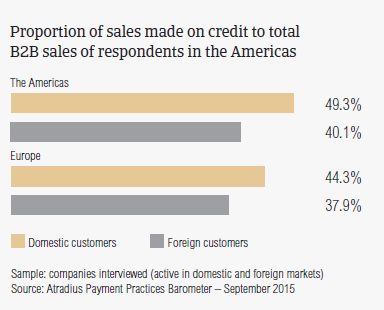 In the Americas, the use of trade credit in B2B transactions appears to be extensive. Nearly 90% of the survey respondents from the countries surveyed in the region (Brazil, Canada, Mexico and the US) reported having offered trade credit to either domestic or foreign B2B customers. Consistent with observations in Europe, respondents in the Americas appear to be more inclined to sell on credit to domestic than to foreign B2B customers. On average, 49.3% of the total value of domestic B2B sales were made on credit, compared to 40.1% of the B2B sales made to customers abroad (averages for Europe: 44.3% domestic and 37.9% foreign). On a country basis, respondents in the US show the strongest propensity to use trade credit in B2B transactions, as well as no clear-cut preference for selling on credit to domestic or foreign buyers. Nearly 51% of the value of domestic, and 46% of the value of foreign B2B sales of survey respondents in the country was reported to be made on credit. In the remaining countries surveyed, respondents are more inclined to trade on credit with domestic than with foreign B2B customers. On average, 50% (Mexico and Brazil) or less (Canada) of the value of domestic B2B sales and 38% (Canada, Mexico) or less (Brazil) of the value of foreign B2B sales was made on credit terms. The above mentioned observations suggest that respondents in the Americas, like respondents in Europe, perceive trading on credit with foreign B2B customers to be more complex and to pose more risks than selling on credit within their own country, where they are more familiar with local trade patterns and business practices. This may explain why, over the past two years, there was no significant fluctuation in the proportion of domestic B2B sales on credit across the countries surveyed in the Americas. The trend in foreign credit-based sales, conversely, appeared to be more volatile. After a sharp drop in 2014, export sales on credit increased again this year, most notably in the US (by 10 percentage points, compared to a 5.7 percentage point increase for the region). This oscillating trend may reflect the heightened commercial and political risk landscape at global business level, which continues to pose various challenges to international traders. Both domestic and foreign B2B customers of respondents in the Americas are given an average of 28 days from the invoice date to pay for goods and services purchased on credit (Europe: 32 days). On a country basis, the US places a great emphasis on swift payment of B2B invoices, with payment terms averaging just over 20 days from the invoice date. On the other hand, Brazil shows the most relaxed payment terms in the region (34 days). Mexico (31 days) and Canada (28 days) fall in between. Payment terms set for domestic and foreign customers vary across countries. In the US, domestic customers are given slightly longer terms to pay invoices than customers abroad, whereas in Mexico and Brazil it is the opposite. In Canada, no big difference between domestic and foreign payment terms was observed. Over the past two years, average payment terms in most of the countries surveyed have shown no significant variation. This except for Mexico, where both domestic and foreign terms are now, on average, just over two weeks shorter than two years ago. In contrast, foreign customers of respondents in Brazil are given, on average, one week longer than two years ago to pay invoices. Despite notable differences across the countries surveyed, taken together, payment default levels in the Americas remain high. 94.7% of survey respondents reported having experienced invoice late payment from their B2B customers over the past year. This compares to a 92.8% response rate in Europe. One in three respondents reported that around 20% of their trade debts were over 90 days past due. This may be a disruptive factor for cash flow levels of businesses. In terms of value, on average, 46.1% of the total value of respondents’ domestic B2B invoices remained unpaid past the due date (Europe: 40.2%). By country, this figure is highest in Mexico at 54.2% and lowest in Canada at 37%. In the US it stands at 46.4%, and in Brazil at 43.8%. Foreign B2B invoices paid late represented 49.1% of the total value of B2B credit-based sales abroad (Europe: 35.4%). Again, this rate is the lowest in Canada at 43.8%, increasing to 44.3% in Brazil, 49.3% in Mexico, and highest at 56.5% in the US. The average proportion of receivables over 90 days past due in the Americas appears to be sizeable. 12.2% of the total value of domestic, and 16% of the total value of foreign B2B invoices was reported to be still outstanding after 90 days past due (averages for Europe: 7.6% domestic and 7% foreign). This increases the likelihood that these receivables will turn into bad debts and write-offs. At country level, the US and Mexico record domestic figures above the regional average (15% and 13.5% respectively). Brazil stands at 11.7% and Canada at 7.2%. As to foreign B2B trade, it is once more the US with a delinquency rate (20.3%) which is notably above the regional average (16%). This is followed by Mexico (15.5%), Brazil (14.2%) and Canada (11.7%). Over the past two years, domestic and foreign overdue payment levels across the countries surveyed in the Americas varied widely. 2014 saw an improvement in overdue rates in Canada and the US. This year, Brazil is likely to see an increase in insolvency levels, as financial conditions tighten and its economy contracts. Mexico’s economic prospects are improving, although the revival in growth is being slowed by domestic political issues and tougher external conditions. All these factors will likely strain the insolvency environment in Brazil and Mexico. Late payment of invoices in the Americas is reflected in the respondents Days Sales Outstanding (DSO) which averaged 30 days. This is almost half the DSO level recorded two years ago. Mexico shows the highest average DSO at 35 days, followed by Brazil (29 days), Canada (28 days) and the US (26 days). Any contrast between overdue invoices and DSO levels is likely to reflect a potential improvement in the respondents’ collection of high value invoices. Consistent with observations in Europe, domestic B2B customers of respondents in the Americas settle payment on past due invoices, on average, within one month after the due date. Foreign customers make their past due payments, on average, 37 days after the due date (Europe: 20 days). 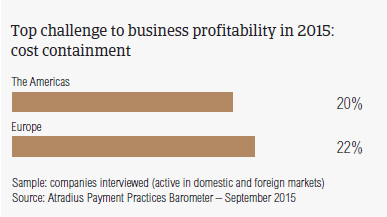 By country, the average payment delay from B2B customers varies markedly. 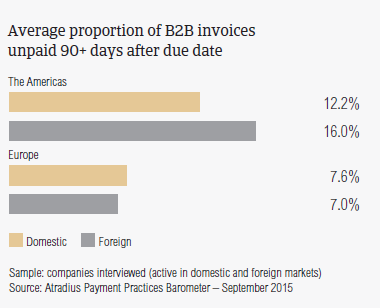 In the US and Mexico, domestic past due B2B invoices are paid, on average, not later than 34 days after the due date. This compares to an average of 29 days in Brazil and 21 days in Canada. Foreign past due invoices in the US are paid within 45 days after the agreed payment terms. In Mexico this time gap is 36 days, in Brazil 32 days and in Canada 29 days. Over the past year, the average domestic payment delay in the US, Mexico and Brazil increased significantly (an average of 15 days). In Canada, the increase averaged five days. Foreign payment delays increased, on average, 19 days or less for respondents in Canada, Mexico and Brazil. Respondents in the US have had to wait, on average, one month longer than they did in 2014 for foreign past due invoices to be paid. As payment delays increase, so do the financing and administrative costs associated with carrying B2B trade debt. 20.3% of the respondents in the Americas consider cost containment to be one of the biggest challenges to business profitability this year (Europe: 21.8%). This appears to concern respondents in Brazil the most (around 23.9% of respondents). Respondents in Mexico (around 20%), in contrast, appear to be more challenged by collection of outstanding invoices, as are those in Canada by a likely fall in demand for their products and services (22.3%). In the US, the percentage of respondents who consider bank lending restrictions (13.2%) to be the biggest challenge this year is higher than that for the region (10.2%) and for Europe (8.5%. This likely reflects a potentially adverse impact of the change in monetary policy on business lending conditions. Most of the respondents in the Americas (46.4%, unchanged since one year ago) reported that late payment of domestic B2B invoices is mainly attributable to their customers’ insufficient availability of funds (Europe: 53.8%). It is therefore vital for suppliers to have comprehensive knowledge and regularly updated information on their customer’s financial strength and stability. By country, late payment from domestic customers due to liquidity issues was most often experienced by respondents in Mexico (51.2%), followed by Canada (47.3%). Response rates for Brazil and the US stand at 44.8% and 42.1% respectively. The second most often cited reason for domestic payment delay (32.8% of respondents in the Americas, compared to 34.3% in Europe) is the perception that customers use trade credit as a means of alternatively financing their business operations. By country, the regional percentage is the highest in the US at 36.5%, followed by Canada and Mexico with 35.8% and 33.2% respectively, and dropping to 26% in Brazil. In Brazil, late payment on domestic invoices is more frequently due to inefficiencies of the banking system (30.2% of respondents). The inefficiencies of the banking system is most often the reason for invoice late payment from foreign B2B customers (37.2% of respondents, compared to nearly 33% last year). Respondents in Canada (43.6%) and Mexico (40.2%) experienced this most often. The response rate in the US stands at 36.4% and in Brazil at 32%. 33.6% of respondents in the region (no change since last year) ascribe foreign payment delay to the complexity of the payment procedure. This percentage peaks at just over 38% in the US, and stands at 34.7% in Mexico, dropping to around 29% in Canada and Brazil. An average of 2.2% of the B2B receivables of respondents in the Americas was reported to be written off as uncollectable (Europe: 1.2%). After an average 1.3 percentage point decrease in 2014, the above mentioned rate increased again slightly (less than 1 percentage point) at the beginning of this year. By industry, uncollectable domestic receivables in the Americas come mostly from the construction, consumer durables, electronics and business services sectors. Foreign B2B write-offs are reported to be mainly related to the construction, construction materials and consumer durables sectors. On a country basis, the proportion of B2B receivables written off as uncollectable is highest in Brazil and Mexico at 2.4% each. In the US, this rate stands at 1.8%, and in Canada at 1.4%. By comparing the proportion of outstanding B2B receivables unpaid after 90 days past due to that of uncollectable receivables, we notice that, on average, businesses in the Americas lose around 50% of the value of their domestic, and 35% of the value of their foreign B2B receivables that are not paid within 90 days of the due date. Europe registers a higher percentage with an average of around 60%. Split by country, our survey findings evidence that efforts to collect delinquent B2B accounts appear to be less successful in Canada than in the other countries surveyed in the Americas. Overall, receivables were reported to be uncollectable most often due to the customer being bankrupt or out of business (54.6% of respondents). This is particularly the case in Mexico (57.5%) and Canada (56.3%). This reflects the challenging business climate in which many businesses still operate. The second most often cited reason for write-offs (just over 37% of the respondents in the region) was the failure of collection attempts. This was most often reported by respondents in the US (46.4%) in relation to efforts to collect in international markets. For 35.3% of the respondents, write-offs were caused by customers who could no longer be located. Again this was experienced most often by respondents in the US (around 40%). In the Americas, domestic B2B customers in the construction materials sector are extended the most relaxed payment terms (averaging 35 days from the invoice date). Foreign customers in the transport and services sectors also benefit from more relaxed terms averaging 32 days each. Average payment terms (domestic and foreign) do not differ significantly across the sectors. Exceptions are the textiles and food sectors, where foreign B2B customers enjoy longer payment terms than domestic customers, and the construction materials sector, where domestic customers are given longer terms than foreign customers. Domestically, the highest proportion of late payments are generated by customers in the machines sector (around 60% of the total value of B2B invoices is paid late). This is followed by those in the agriculture, food, metals, construction materials and construction sectors. Together with the textiles, consumer durables and electronics sectors, the construction and construction materials sectors recorded the largest proportion of past due foreign invoices as well. Late payments from domestic B2B customers due to insufficient availability of funds are reported to occur most often in the agriculture, food and chemicals sectors. The majority of the respondents in the Americas don’t expect changes in the payment behaviour of domestic customers over the next 12 months. However, a sizeable percentage (25%) of respondents in the construction, construction materials and machines sectors expects the payment behaviour of domestic customers to deteriorate over the same time frame. Payment delays on foreign B2B invoices due to inefficiencies of the banking system occur most frequently in the textiles sector (around 48% of respondents). Late payment on foreign invoices due to the complexity of the payment procedure occur most frequently (67% of respondents) with customers in the paper sector. The majority of the respondents in the Americas don’t expect changes in the payment behaviour of foreign customers over the next 12 months. Three in five respondents expect a slight deterioration of the payment behaviour in the construction materials sector, and around half of them have the same expectation of customers’ payment behaviour in the machines sector.